I thought I'd write up a FAQ regarding questions I receive a lot on Instagram, Twitter and right here on the blog. Hope my answers are helpful! Are those your natural nails? Yes. Other than a brief week in the winter of 2010 where I had acrylics for all of three days before they drove me crazy, every picture on this blog is of my natural, unenhanced nails. How do you paint your nails? How did you learn? I did in fact go to cosmetology school but found that though I learned a lot about salon services, painting nails is more of a practiced art than something that can be taught. Really, painting my own nails over and over again is what truly taught me. 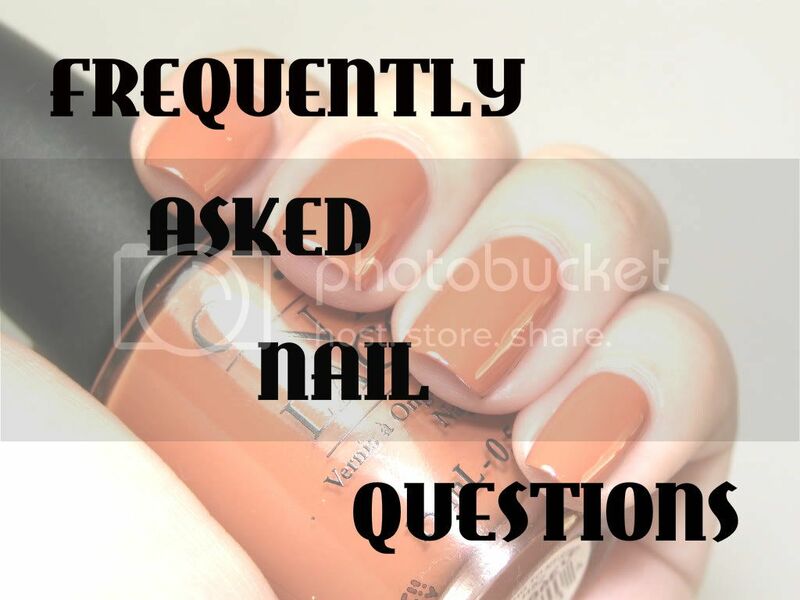 Why do you leave a slight gap between your skin and your nails? I prefer that look. To quote my good friend Gaby, "I prefer not to look like I fingerbanged a bottle of nail polish." I have to agree, I find that when you get polish on your skin, it can emphasize cuticle condition, especially if they are dry, scraggly, rough. etc. I like to leave that thin little gap to prevent polish from pooling into the skin, since that can sometimes look bloody if I'm using red polish! How do you clean up your manicures? Er, I don't most of the time. It's part of how I paint my nails, the polish doesn't ever really get that close. But for watermarble or nail art that creates a mess, I used a small eyeliner brush dipped with acetone to create those crisp edges. Do you take any vitamin supplements help grow your nails out? Well even though I like to eat those delicious gummy vitamins from Costco (they say 'Adult' on them! I'm a real grown up, I swear! ), I honestly don't eat them for any nutritional value. I just like them because they are low in sugar and the peach ones are ridiculously tasty. I am high skeptical of biotin supplements for nail growth because I have yet to see an actual study that says they help nail growth in any way (aside from those with conditions that result in a sever biotin deficiency but from what I understand, those are quite rare). So until I see any solid information on it, I don't plan on taking anything. Ensuring general good health though, is vital for nail growth. For example, when I'm sick or stressed out I tend to see more ridges in my nails. What about topcoats and basecoats? Do those make your nails grow? Well here's the thing. Nail growth occurs in the matrix. Products like base or topcoats are applied to the nail plate which though is porous is still dead. So while treatments can fortify or lend elasticity to your nails, they can't make something that is already dead grow. So while I love how strong Barielle Protein Treatment makes my nails, it does nadda for nail growth other than protecting the growth that I already have. Hope that has been helpful! I am not a physcian, these statements are in no way intended as medical advice. For additional information, please refer to my Disclosure Policy.